"I'm known as Sugandaraja on a few forums and blogs. I'm a twenty-something world traveler with a taste for spices, animal notes, and sultry, indolic flowers. I got started with essential oils and resins, and through the wonder that is the online fragrance community, have had the good fortune to explore hundreds of niche and vintage fragrances over the past half-decade. I think of fragrance as an art somewhere between fine cuisine and ambient music, and I don't pay much attention to gender, fashion, or fragrance as a weapon of seduction. I'm currently based in Egypt, the land of oud, musk, and poorly-named designer copycats, but you never know where I might be next..."
Please note all the reviews in this section are posted with the authorization and collaboration of the authors. In the name of disclosure: Miriam fascinated me well before I had the opportunity to sample it. It featured a collaboration between one of my favorite perfumers in a film featuring one of my favorite performance artists, and was one of the first mixed-media projects I've seen that took fragrance as a serious part of its creative side, rather than just an accessory. I'm assuming a typical fragrance blog reader is well-versed enough in the world of Andy Tauer, but Ann Magnuson ( the actress starring as the eponymous Miriam ) has had an eclectic career that has had her turn up in the unlikeliest of places. The role of Miriam is a world away from where I know her most, the comedic psychedelia of the band Bongwater. The following video should give a taste of what I mean ( but, be advised: as with most Bongwater, it's rife with adult-only content is very far from work-appropriate ). I was quite intrigued to see how Ann would pull off quite so prim and nostalgic a role. The fragrance itself marks a notable change in style for Tauer. 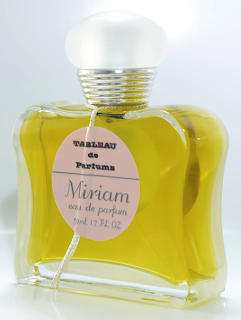 While Une Rose Chypree hinted at vintage interests ( though it remained a big-boned Tauer-iental ), and Carillon Pour Un Ange went further, departing fully from oriental and being more of new-style chypre than Une Rose Chypree, Miriam finds Tauer in new territory. Neither the smoky amber nor tangy mandarin notes that seem to typify a typical Tauer are present, nor is there a certain bold, architectural style I feel in the others. Miriam smells of another age. The classical aldehydic floral has a certain style that marks its time. It is powdery, sparkling, and while floral, one would never mistake it for a real flower. It is the farthest departure both from the single-note floral waters of the Victorian age and the photo-realistic soliflores common in modern niche. In this sense, Miriam is very hard to dissect in terms of flowers. Rose, jasmine, violet are all there from first sniff, made wanly reserved by aldehydes and a faint, cool, metallic note, together with powdery woods that feel somewhere in the vicinity of rosewood and sandal. It is very powdery, yet hardly sweet at all: the olfactory equivalent of the powdery centers of old-fashioned lemon drops. Of course, the shadow of Chanel No. 5 looms large over any aldehydic floral. Suffice to say, they are on speaking terms, but I wouldn't call them relatives. The Chanel is smoother, plainer, louder, and more extroverted. A theme of Tableux de Parfums is female heroines from the '40s, and I could easily link Miriam's style with Joan Crawford's polite, careful, yet deeply controlling and manipulative main character in 1950's Harrier Craig. 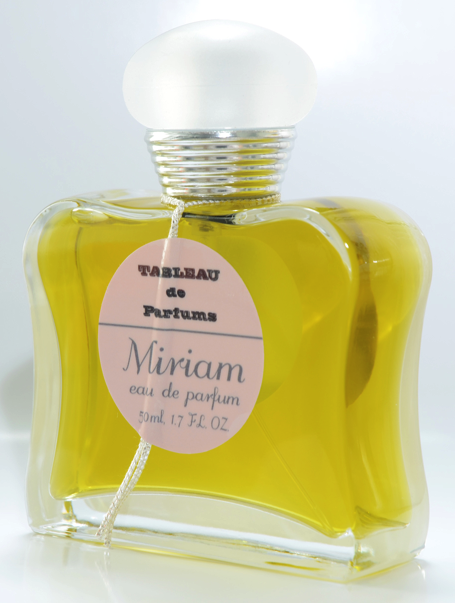 Miriam isn't exaggerated enough to be sinister, but it is coolly reserved in a way that you know would cause a war of words if put into the same room as an embodiment of, say, Amouage's Gold Woman. The Miriam of the film is a far more sympathetic woman, living at odds between a senile mother, a drifter boyfriend, and work pressures threatening to squeeze out her little on-screen world that's hers alone. It's a melancholic portrait, perhaps not an exact match for the perfume in my eyes, but similar enough in mood to make it a decent pairing. 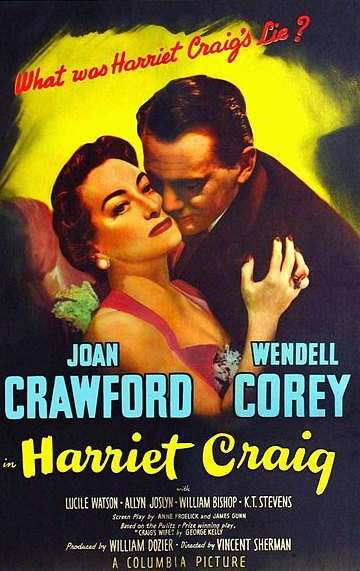 The DVD offered some intriguing hints about Loretta ( so far the only detail Andy's let out is that it's tuberose-prominent ), and Ingrid, following later this year and in 2013 respectively. Let me be one to say I'm very curious to smell what's in that animal-print factice! Rating: 9/10 - a beautiful, delicate homage to a past age of perfumery. Sample Disclosure: I won my sample and DVD in a draw on Tauer's blog.